Dear Martin, It’s OK! 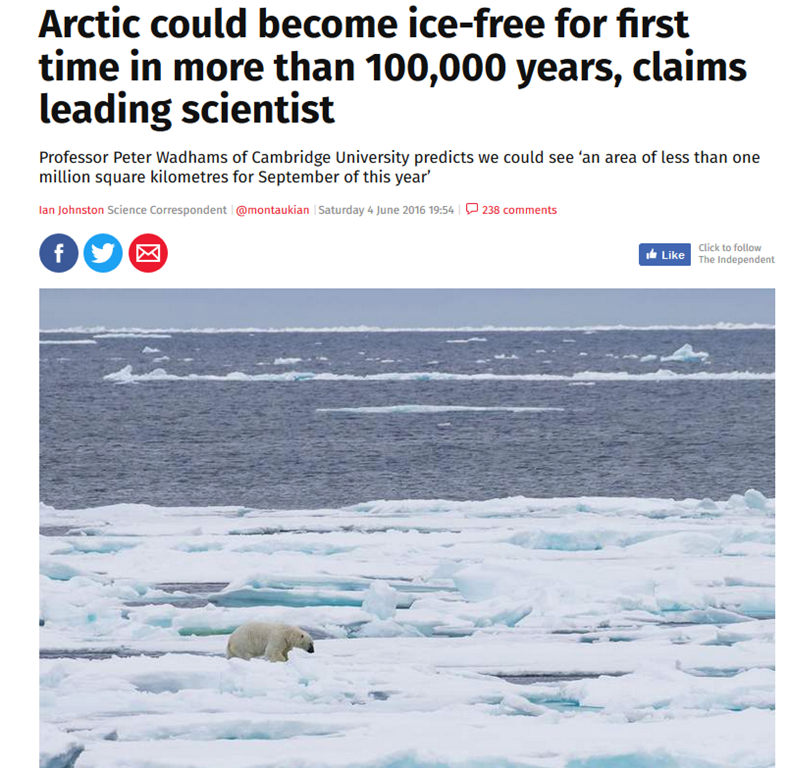 you can stop worrying about the Arctic….. John M.
Wadhams, like the other experts, get their moment of pontifical lecturing from a “Fear-campaign” frantic press, but never seem to appear when the predictions are proved wrong, nor do the press! When “experts” prove their inadequacy, they should be discredited as experts. However, having been involved with expert witnesses in legal cases I do know that there is no hard definition of an expert. Is there any evidence to support the claim that the Arctic has not been ice-free in 100,000 years? It may well have been so during the MWP, how does anyone know? I believe that even his own side disowned Wadham after that 2016 claim. If not, they certainly did once he claimed a Big Oil hit squad was bumping off scientists after 3 died in a short time – but with explained circumstances. One was run over by a truck outside my office. To label Peter Wadhams as a leading scientist and an expert is just a slight bit of exaggeration. Has he ever got anything about the Arctic sea ice right? Darned Arctic Sea Ice. Get with the program. Despite the hysterical shouting from Alarmists when the temperature was “high” at the beginning of the year! Looking forward to the BBC’s top science correspondents covering the failure of the Arctic this summer to conform to the predictions of the ‘settled science’ priesthood. How are the polar bears doing? Oh, their numbers are growing too against all ‘settled science’ projections. Make a good ‘double header’ news story that. Can’t wait to watch it. Shall I hold my breath? Must be quite depressing at Doomster HQ with nothing out of the range of natural climatic variability occurring anywhere this year, despite how much they have tried to ramp up the usual heatwave, bush fire and flooding stories. You’d have thought they’d be wishing for a hurricane to really try and get their narrative back on track…. oh, hang on a minute, wait for it! Regardless of the censorship shenanigans at the Beeb, I do sincerely hope that the poor people in the path of Hurricane Florence stay safe. The only meltdown is in alarmists’ brains. In reply to Jack Broughton’s comment it is thought that the Chinese were happily sailing junks in the Arctic some 500 years ago. But then, why let this inconvenient fact spoil a really good story? And yet it still doesn’t support their claims. 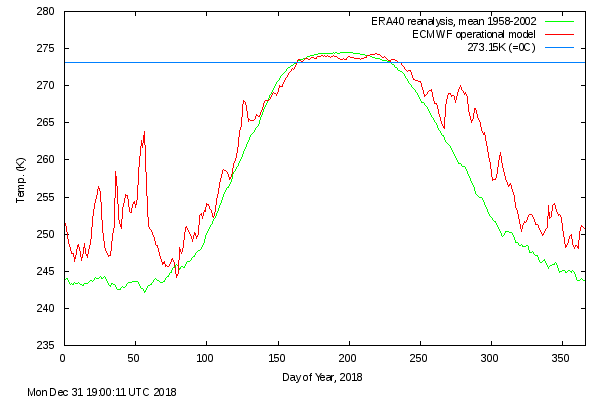 In the topsy turvy world of Wadhams if Arctic sea ice extent is down to its’ last 1 million km2 of ice doesn’t that equate to the Arctic being technically ice free? In which case, 5 Wadhams must mean the Arctic is really, really, really, really, really ice free this summer. Just don’t believe your lying eyes. Is there a University degree in TTB! Known in East Anglia as talking total balls. 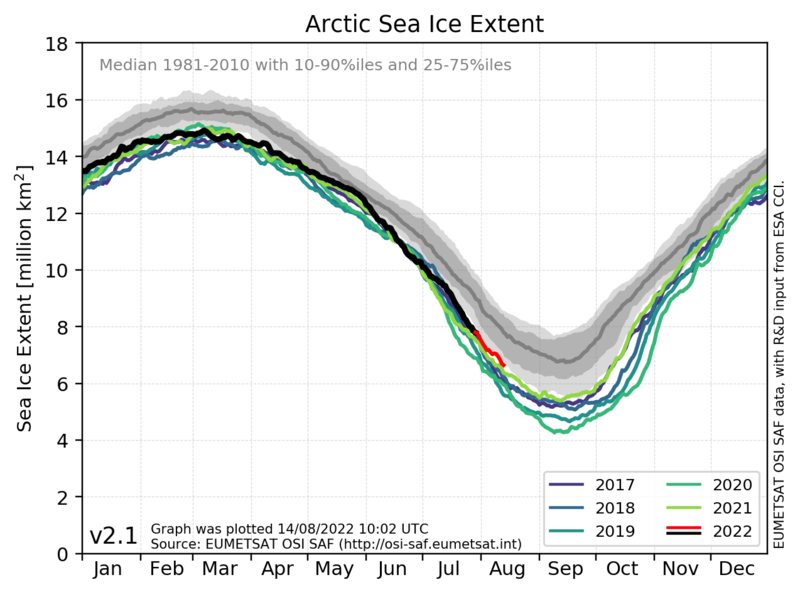 The “1 million sq km” nonsense appeared a few years ago, when the Wad (mistakenly) thought the ice-extent was going down to this; and so he hurriedly claimed this was what he meant all along. “Professor” Wadhams has blocked emails from me because I pointed out, to him, that actual sea-ice extents were not following his model and predictions. He is what you would call a sore loser. A bit off topic and declaring my ignorance of Atlantic hurricanes, but how do they know that hurricane Florence will continue on a straight line to N. Carolina, when most seem to veer off north easterly before or when they hit mainland USA? Last night I saw a TV ad for WWF that was clearly making false claims about melting ice and its supposed effect on polar bears. A complaint to the advertising standards authority is on my to do list. They have found the wreckage of a Scottish whaling ship Nova Zembla off Baffin Island. The discovery is part of The Northern Seas project which will use ships logs etc. to determine ice conditions dating back to 1750’s. It part of Arctic Institute of North America.